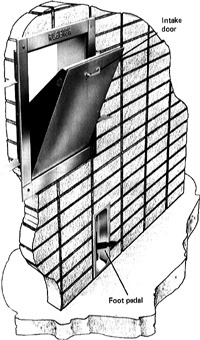 A door that penetrates a wall enclosing a refuse chute and through which waste material is deposited directly into the chute. The parts are made from a plastic material and include protective covers for Tornado cockpit radios, support struts on the air intake door and protective guards for Power Take-off shafts. It's common knowledge that intake-FOD can end up behind the bottom auxiliary intake doors. Air intake doors were along the bottom and a single door on the side allowed green hay to be blown into the shed.